The Benjamin Perry House is a 1927 brick bungalow. 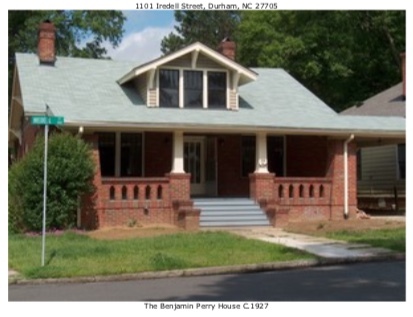 The Benjamin Perry House, located at 1101 Iredell Street, was built in 1927. It’s a side gabled, tapestry brick, American Craftsman bungalow with heavily bracketed eaves, four interior fireplaces, and a wide front gable dormer. The front shed-roofed porch has battered brick craftsman style support posts, railings and an attached Porte-cochère with bracketed eave. The house retains most of its 1920’s features. Windows are over-sized Craftsman 4-over-1 double hung sashes that match the Craftsman glazed entry door. The formal living spaces (living and dining rooms) take advantage of a southern exposure while the private spaces (bedrooms, bath) are located on the north side of the house. The formal spaces use oak flooring and plaster ceilings while the kitchen and three bedrooms use old-growth heart pine flooring and bead board ceiling. Ceiling height downstairs is 10’ and a 5' wide central hall runs the length of the house. In 2011, the house was sold and renovated. The mechanical systems, kitchen and bathrooms were updated, and the doors and windows repaired. Part of the back porch was enclosed to create a walk-in closet off the back bedroom. In 2018, another renovation occurred to reconfigure and update the downstairs bathrooms and add a staircase off the central hall to the attic which was finished as a master suite. Two dormers were added to the back of the house to accommodate the staircase and master bath. Repairs were made to the side gables and roof soffit after vinyl and aluminum siding was removed. A detached garage was also built in the backyard with access from the alley. In 1949, the house was sold to James Norris, who had been renting a room in the house for several years. On James Norris’ death, the house transferred to his wife, Mattie (Matred) B Norris. On Mattie Norris’ death in 2001, the house transferred to Perry Norris, their son. On Perry Norris’ death in 2010, the house was left to a local church. On 31-Jan-2011, the house was sold to Irish Adrian. On 27-May-2011, the house was sold to Todd and Lindsey Schuler. On 01-Jun-2016, the house was sold to Keith Bowden and Bob Levin.